We motor out of the Damariscotta River in July 2006 and head east. The plan: travel along Maine&apos;s shore, cross the Bay of Fundy, go up the east coast of Nova Scotia, cross Chedabucto Bay to Cape Breton, and enter the Bras d&apos;Or Lakes. The goal: test our cruising skills on that fog-bound coast, view the spectacular scenery of Nova Scotia, confirm our trust in our chosen boat, and learn a little more about ourselves. Who are we? A retired couple married 46 years, with more years than that in boating together in vessels small and large, sail and power, cruising the area from Norfolk, Virginia, to Mahone Bay, Nova Scotia. The total crew is myself; my wife, Meradith; and Princess the cat. Our chosen boat for this cruise? An Atlantic Boat Company Duffy 35 "lobster cruiser" named Trekkin, finished by us, starting her third year of cruising. We have been planning this trip for seven months, getting charts, guidebooks, and Canadian publications as well as the appropriate chip for the chart plotter. The last week of June was a frenzy of last-minute grocery shopping, loading the boat, and checking and rechecking multiple lists. A critical part of any good cruise is food, but for this trip, we were unable to gather information about the availability of shopping. So we implemented our time-tested drill: loading up with canned stew, chili, tuna, peanut butter and jelly, and so on. In perusing the aisles of our local supermarket, Meradith also turned up some boat-friendly products, such as vacuum-packed salmon, and muffin mixes requiring only the addition of water. At least we wouldn&apos;t starve! During the stocking-up frenzy, Meradith also loaded the boat with as much fresh fruit, vegetables, bread, milk, and eggs as she could fit, and a selection of meats frozen at home to be stored in our modest onboard freezer. At last, Trekkin was ready. She is equipped with a Cummins 330hp diesel; a Lofrans anchor winch; a Standard Horizon GPS/chart plotter and VHF and AM/FM radios; Raymarine radar with MARPA, autopilot, and a fishfinder; a KVH electronic compass; a FloScan monitoring system to measure fuel usage; a Ritchie magnetic compass; and a cage around the prop to protect us from trap floats. The chart plotter, radar, autopilot, VHF radio, and KVH compass are linked. We use the fishfinder mainly as a depth finder and to view the bottom before anchoring; fishing is not in our bag of tricks. In addition to the C-Map chips for the chart plotter, we always carry a complete set of paper charts covering the area we expect to cruise. We use the charts to plan the next day&apos;s passage, laying out the courses and distances and putting in the waypoint numbers before transferring the information to the chart plotter (I don&apos;t use routes). With the magnetic compass, we can also go back to navigating the old way if needed. An additional advantage to paper charts is that Meradith can follow the legs of the trip on the chart, confirm our course, and cross-check that we are going by the correct islands or buoys. We headed out, spending four days harbor hopping in Maine and then crossing the Bay of Fundy with no problems. Although anticipation of the crossing can be somewhat stressful, we found that waiting for a good weather window and then moving out with determination turns it into no big deal. Boats coming from the south often head straight for Shelburne, Nova Scotia, which eliminates the stress of the Fundy crossing but requires an overnight passage. Our first stop in Canada was Yarmouth, Nova Scotia. On previous visits to Canada, a phone call to CANPASS had been sufficient for clearing customs. But on this trip, customs officers wanted to see us and our boat at the dock, with our personal papers and boat documentation in hand. When two officers came aboard with side arms and bulletproof vests, it did get our attention. Their explanation: "We don&apos;t know who and what you have on board, so we have to be prepared." Once they confirmed we were just two older folks with a cat, all went fine. Stop two, Shelburne, was truly the start of our cruise. It is a harbor we strongly recommend. Since our last visit 15 years ago, the Shelburne Yacht Club had built a wonderful new facility with showers, laundry, Internet access, a bar, and a lunch counter. There is a good fuel dock, a marina with space for several transient boats, a few moorings, and excellent space and holding ground for anchoring. A medium-size market can be reached by dinghy, and there&apos;s an interesting historic area, as well as several shops and restaurants (Charlotte&apos;s is a great one; be sure to make a reservation). Despite our inability to gather information about shopping before our trip, throughout Nova Scotia we found several excellent large stores near the waterfront with fresh food, occasional small markets to supply that essential loaf of bread, and good restaurants so that we could enjoy one dinner out weekly (with prices comparable to those in Maine). For many boaters, Shelburne is the check-in to Canada or the last stop before heading for a distant port. We met a couple headed for Trinidad, another family leaving for Norway, and a pair who&apos;ve lived on their boat for 10 years and go south for the winter. We found a mix of powerboats and sailboats, medium to large in size. As we continued along the south coast of Nova Scotia, we ran into fog; visibility was limited to about 1/8 mile, with some lifting near the shore. Although we have all the necessary electronics for fog piloting and are relatively comfortable in fog (we work together to identify returns on the radar), being able to "eyeball" a mark is reassuring. We have found that Canadian buoys usually are smaller than their U.S. counterparts, with outside marks visible at about 1.5 miles versus 3 miles for U.S. buoys. Often, inner channels are marked with just a small colored stick. The offshore fog persisted for close to two weeks; with quiet seas, we continued to move along, but in short hops of four to five hours a day. Excellent binoculars were a big help. One of the most picturesque respite stops was Tanner Pass. Small boats from Lunenburg use the pass for recreational fishing; inside, local commercial boats are tied to small fishing docks, and houses are perched along the shore. Schooner Cove, a widening in the channel, provided a secure anchorage bordered by rock ledges and islands and gave protection from the open Atlantic. As we proceeded along the coast, Halifax, the capital city of Nova Scotia, was a "must" stop. We chose to go to the Armdale Yacht Club for fuel and water and to find a store to replenish fresh foods. We met some great people at the club, including Muriel and Vic, who took us grocery shopping after dinner one evening. Vic&apos;s grandmother lived on Tancook Island, where the Tancook whalers were built, and one of Vic&apos;s ancestors is David Stevens, the Canadian yacht designer. Jim and Diane owned the large powerboat moored beside us. When we asked about bus service to the city, Jim insisted on driving us to the waterfront so that we could enjoy the many tourist attractions. Another boater, Don, who has a marine business, showed me his AIS system. These gracious folks were typical of the many friendly Nova Scotians we met. We discovered that while we preferred secluded anchorages for their scenic beauty and peacefulness, if we wanted to meet people, we had to go to the cruising centers and marinas. One other must stop is Liscomb Lodge Marina. The marina is really a floating T-shaped dock with space for two boats alongside. We wanted to fill our fuel and water tanks; however, there were six boats rafted three abreast at the dock, so fueling was impossible at the time. We picked up a mooring for the excellent price of Can$30 and were pleased to find that the fee included use of the swimming pool, sauna, Jacuzzi, and showers. The marina office had a washer and dryer for doing laundry. We unanimously voted for a layover day and headed for the pool! We thoroughly enjoyed our stay at Liscomb Lodge; it wasn&apos;t tough to convince ourselves to swim, lounge around the pool, and take unlimited showers for two days. As we neared the end of Nova Scotia&apos;s eastern shore, we sought one more harbor as our takeoff point for Cape Breton. We rounded the White Point rocks and ledges south of Little Dover Island. With no fog and nothing but the open Atlantic to the south and east, these were the most awe-inspiring of all the rocks and ledges we passed. Turning north, we headed for Andrew Passage, glad for the opportunity to take shelter behind the island and escape the large ocean swells. At the end of Andrew Passage, we came to Glasgow Harbor, a beautiful, deserted, and very well-protected stop. One of the joys of cruising for us is to watch animals in their natural environment. At dusk we watched a deer browse along the shore; osprey were catching fish and flying back to their nests. The sunset at Glasgow was beautiful, and we felt safe and secure. We were ready to enter the famed Bras d&apos;Or Lakes of Cape Breton, two bodies of water connected by Barra Strait. The southern body is labeled as a lake on the charts; the northern body is labeled St. Patrick&apos;s Channel, St. Andrew&apos;s Channel, and the Great Bras d&apos;Or, which is the northern entrance to the lake from the Gulf of St. Lawrence. Since Cruising Guide to the Nova Scotia Coast refers to these bodies of water as "the lakes" and is endorsed by the Cruising Club of America and Royal Nova Scotia Yacht Squadron, I&apos;ll defer to their judgment. The southern entrance to the lakes is St. Peter&apos;s Canal. We locked through with a large power cruiser and a 42-foot sailboat. Because the water level change was small, there were no current swirls as we rose to lake level. Going through the canal, one feels a bit like Alice going through the looking glass. One leaves behind the Atlantic, with its potential for high winds, waves, and continuous fog, and enters the benign environment of the lakes, with warmer air, limited fog, a miniscule tide, and warm water with a lower salt content (which results in a much cleaner boat). The first stop for most boats after locking through the canal is the marina run by the St. Peter&apos;s Lions Club, which also operates a sailing program for disabled and non-disabled children. Gerry, the manager, and his staff were very helpful. The marina has fuel, water, a huge bank of washers and dryers, Internet access, plenty of showers, and a common room with a television and kitchen area. We walked about a mile into town, where we found an excellent grocery store (and a courtesy ride back to the marina), gift shops, and restaurants. Friendly Canadians at the marina offered many recommendations of harbors in the lakes. It was a very enjoyable stop, one we repeated on our way out of the lakes. After a night in the marina, we began our cruise in the Bras d&apos;Or Lakes, the easternmost goal of the voyage. The harbors we visited on the western side of the lake were within an hour&apos;s motoring of each other. In most harbors, we were surrounded by spruce forest, and we saw only one or two houses and no other cruising boats. In general, we saw few Nova Scotian cruising boats and almost no American boats. We had planned about 10 days for our visit to the lakes, so we had to choose a representative group of harbors based on recommendations of the cruising guides and individuals. The first harbor, McKinnon&apos;s, had a narrow, shallow entrance (20 feet wide and 8 feet deep) that was in a different place than shown on the chart. Unlike most of the harbors we saw, quite a few cottages dotted the shore near the entrance. Farther in, the shore was mostly wooded. Next was Maskell&apos;s Harbor, reputed to be the best and prettiest on the lake. On the port side going in, a lighthouse stands high on a bluff; to starboard is a hooked sandbar that closes off the mouth of the harbor, protecting it from swells. Inside, the water is deep, so the anchorage lies along the sides, which are steep rocky walls; the harbor ends in a marsh, giving the impression that you are anchored in a mountain lake. To top off the visit, we saw two bald eagles! The farthest north and east that we traveled was Baddeck, capital of the Bras d&apos;Or Lakes, a town of about 1,000 whose economy is focused primarily on tourists. We grabbed a mooring and spent the day exploring the town and going out for a delicious dinner. Our last anchorage on the lakes was Deep Cove, off the Washabuck River. We headed into the cove to a spot where we thought the deep water ended, and we anchored. Surrounded by impenetrable woods with lots of blow-downs, we explored the cove and river with the dinghy. We found another eagle&apos;s nest near the cove entrance. Shortly after we returned to Trekkin, a beautiful blue wooden power cruiser entered the cove and traveled much farther than we had thought possible. On the way by, the owners invited us for a cup of tea on their boat. 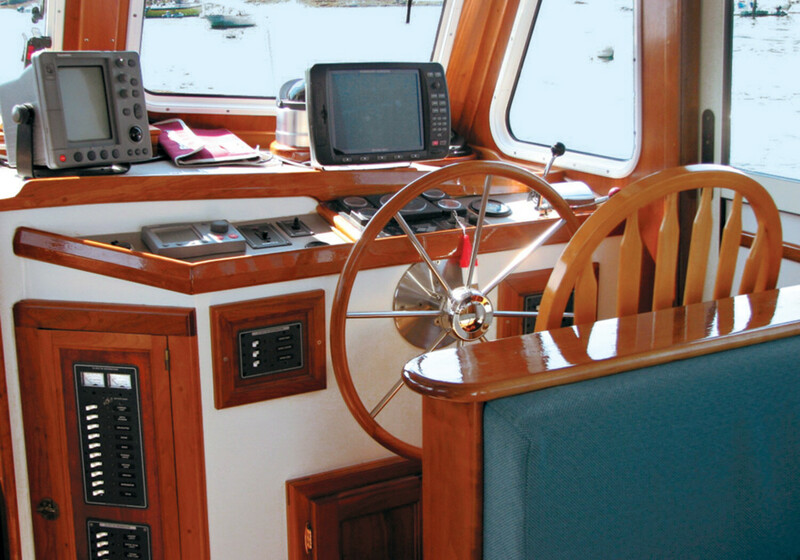 Eric and Linda told us that when they&apos;d purchased the 45-foot wooden yacht, she had needed some TLC. They had removed the deck and cabin, taking the boat down to a bare hull, and from there had proceeded to rebuild Debbie Fina into a lovely cruiser. From a distance, the hull looks like glass; up close, the sweeping lines of her planking become apparent, and it is clear she was built by real craftsmen. After spending eight days enjoying the peace and tranquility of the lakes, it was time for us to head west. As we left St. Peter&apos;s Canal, three older fishermen took note of Meradith&apos;s skill in clearing off the fenders and coiling the docking lines. "Great crew," I yelled, and they waved in agreement. We returned to Glasgow after a rough trip across Chedabucto Bay. The distance was about 24 miles into 15- to 20-knot winds, with 4- to 6-foot seas and whitecaps all around us. We motored at about 8 knots, enjoying the change from the lake and appreciating how well the boat handled. Our next stop was Country Harbor, followed by Liscomb Lodge. Then, it was on to a different harbor at Jeddore, the last good harbor before Halifax, according to the cruising guide. We left Jeddore and bypassed Halifax to visit Rogue&apos;s Roost, which is unlike any anchorage I&apos;ve visited. The channel to the entrance runs between islands, with nuns marking the rocks under the surface. The channel then passes between two large rock ledges, and the entrance to the harbor appears to starboard. A small outboard was coming out as we approached; the skipper sped up when he saw us, so I assumed there wasn&apos;t enough water for us both to be in the channel. He hung close to the rock cliff on his port side, so I stayed close, too. The pool reminded me of pictures of anchorages in Scandinavia or on the Great Lakes where the boat drops an anchor from the bow and ties off to rocks on the side of the anchorage. Large rock outcroppings rise all around the shore of the pool. The west side is very deep; I could have put the bow against the rock and not touched, even at low tide. The tide was low when we left the next morning, and the entrance channel looked even more hair raising. So I asked Meradith to watch from the bow to make sure I missed the rocks. As we worked our way back along the south shore of Nova Scotia, we felt conflicted. We looked forward to returning to the United States but felt disappointed that we hadn&apos;t been able to visit every wonderful beckoning harbor. Some great stops that we did make included Chester in Mahone Bay, the LeHave River, Port Mouton (with a beautiful beach but cold water), and, of course, Shelburne. We continued on down the coast and around to Yarmouth for the final crossing of the Bay of Fundy. The day we crossed, the forecast called for southwest winds at 15/20 knots with higher gusts, but the U.S. forecast predicted southwest winds at 10/15 knots. The crossing was rough; we had to slow to 10 knots when we hit the Fundy current, but we returned to the 14-knot range once we were past the worst. Forty miles from Mt. Desert Island, we saw the top of the mountains and knew we were almost home. Clearing U.S. customs was a painless experience. The customs officer was highly professional, asking a few questions, checking our passports, and welcoming us back to the United States. A layover day was declared at Northeast Harbor, and then we began cruising back to Damariscotta, stopping at some of our favorite anchorages, which now seemed crowded with boats, houses, and people. Our cruise was eight weeks long and approximately 1,400 miles round trip from Northeast Harbor, Maine; we used 624 gallons of fuel and motored for 147 hours. Getting fuel is always a concern for a powerboat. West of Halifax, the only sure fuel stops are Shelburne and marinas in Mahone Bay. East of Halifax, Liscomb Lodge is the only sure place to fill your tank, and you can refuel at St. Peter and Baddeck in the Bras d&apos;Or Lakes. Whenever we had a chance, we filled up. At over Can$4 per gallon, fuel was clearly the single major expense of the trip. With her time-proven lobster hull design, Trekkin handled as expected. Her large rudder contributed to the autopilot&apos;s ability to control the boat without a lot of slewing around off swells. We had no trouble keeping her on course. Our ability to increase speed beyond the normal cruising level was important when making runs across areas such as Fundy, where the weather can get nasty. Except for our stop at the yacht club marina in Halifax and on moorings at Liscomb Lodge and in Baddeck, we anchored out every night. Our working anchor is a 35-lb. CQR with 100 feet of 5/16-inch chain, 150 feet of 5/8-inch nylon, and a chain hook on 20 feet of 1/2-inch nylon. The keys to retrieving the anchor are our winch, having a washdown hose on the bow to clean the chain as it comes up, and Meradith&apos;s boat handling (getting to the anchor, and then heading to deeper water while I clean up the deck). Because we had plenty of room in all of the harbors we visited, we always anchored using the entire 100 feet of chain. One night, anchored in 10 feet, the wind gusted to 48 knots, and we were happy to have that chain in front of us. Our dinghy, which we use for exploring anchorages and going ashore, is a 12-foot Avon soft bottom with a 6hp outboard motor. While under way, we stow the motor in Trekkin&apos;s cockpit on a bracket, and we pull the dinghy up over the transom so it rests in the cockpit. Many of the boats we saw in the marinas had a dinghy similar to ours or an inflatable with a hard bottom; nearly all of these were in davits or on deck when under way, rather than towed. For us, one of the greatest pleasures on any cruise is the wildlife we see. Offshore, we saw very large seals but no whales. We saw about 15 different kinds of birds; especially notable were the bald eagles. On our return trip to Yarmouth, we watched as a fox crossed a bar to reach a bird nesting area. This cruise was not filled with social activities: there were no parties or nightclubs. We were our own tour guides, and we enjoyed reading the nearly 40 books we brought along. We wouldn&apos;t think of holding a rummy tournament at home, but this activity perfectly suited the muted and relaxed tone of the trip. After many years of marriage and lots of cruises, we went with realistic expectations for our boat and ourselves. Our conclusion: we had a great time! 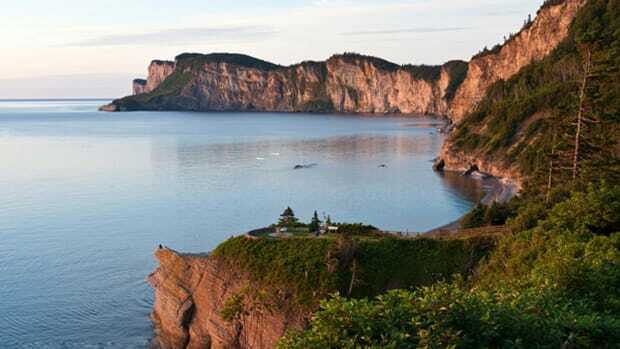 While we achieved our goal of reaching the beautiful Bras d&apos;Or Lakes, perhaps the most interesting and challenging part was traveling along Nova Scotia&apos;s Atlantic coast. During the summer, with lobster season past, it is nearly deserted. We saw clusters of Canadian cruisers, mostly sailboats, in their favored locations; the Canadian power cruisers that we saw were primarily converted fishing trawlers. Of the American boats, we saw only three of the trawler type; most were sailboats. We were pleased to find all the amenities we needed, and the people of Nova Scotia were unfailingly friendly and helpful. This cruise is certainly doable, but Cape Breton is a long distance away from most U.S. harbors. It&apos;s a wide world out there, and while our "big" trip may be tame compared to what others are doing, we did push our personal envelope, and we achieved our own goals. So, what&apos;s next? Bahamas, here we come!